I just received my Nikon D800 a few days ago and I'm still learning all of its nuances. The D800 is a full frame camera, meaning the image sensor is the same size as 35mm film. If you attach a standard 35mm lens, you will get the same coverage that you would get on a 35mm film camera. This is nice. I can finally use my Nikkor 24mm f/2.8 lens to take wide angle pictures like I used to do with film. When I put my 24mm lens on my Nikon D7000, the image is cropped because the sensor is smaller. On the D7000, my 24mm lens becomes like a 36mm lens. Not so good if you want a wide angle shot. Nikon calls the D7000 a "DX" format camera while the D800 is called an "FX" or "Full Frame" format camera. All of my good old fashioned, 35mm lenses that I used to use on my film camera, are FX lenses. Some of the newer lenses that I bought for cameras like the D70, D90, D200, and D7000, are DX lenses. DX lenses use smaller glass elements because they're made for the smaller sensor cameras. If you put a DX lens on a 35mm film camera or a FX digital camera, the image from the lens won't always fill the whole frame. You'll see black around the edges of the image, known as vignetting. I'm pleased to tell you that you can turn off the DX crop feature!! Yes, you can go into the menus of the D800 and set it to take full, 36 megapixel images all the time, no matter what lens you stick on the camera. This is awesome. One of my favorite lenses is my DX 35mm f/1.8 lens. You can buy this lens brand new for less than $200, its super sharp, and its an f/1.8 lens! Ah, but its a DX lens. That's why its so cheap. Anywhere you look for this lens online, it will say something like, "DX lenses are NOT recommended for use with FX or Full Frame Cameras." I'm sorry, but rules in photography are meant to be broken. Don't tell me not to try my DX lenses on my FX camera! Thankfully, someone at Nikon knew there would be people like me out there and included the option to TURN OFF the DX crop!! 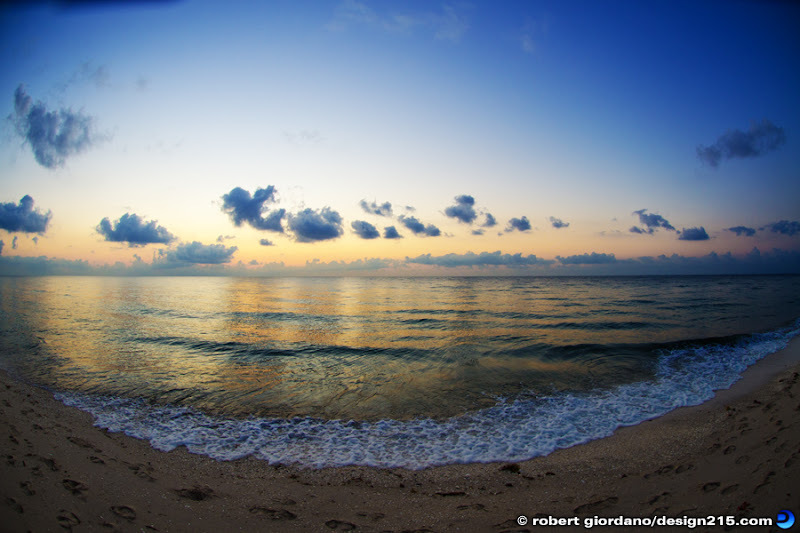 I set up a tripod on the Pompano Beach fishing pier and used my DX 35mm f/1.8 lens on both cameras. Both cameras were set to the same exposure and the images are unretouched. 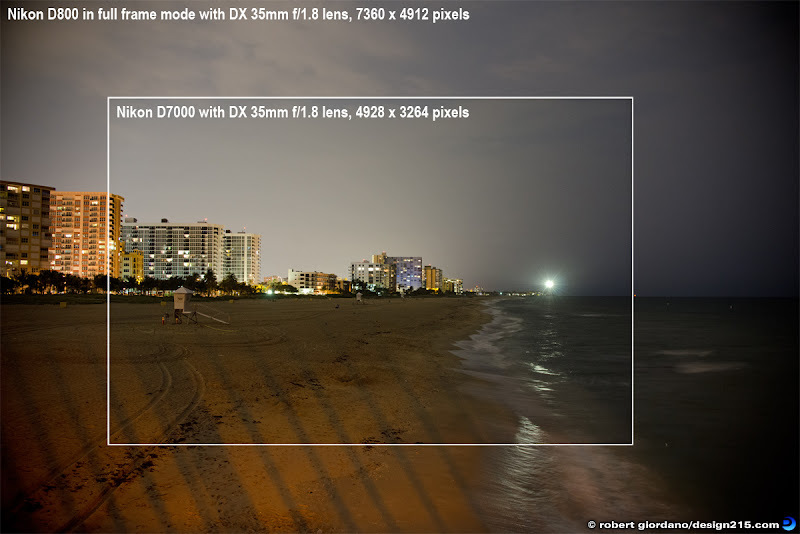 The inner image from the D7000 is the same image you get with the D800 and its DX crop feature turned on. When you turn off the DX crop on the D800, look what you get! Yes, there is some vignetting around the edges but is that so bad? Obviously it depends on what you're shooting but its nice to know I have the freedom to choose whether I want my images cropped in the camera or not. Finally, the D800 gives me a third option, called the "1.2" crop, which is between the DX crop and full frame. I'm not sure where I would use it because I can always shoot full frame and just crop it later in Photoshop. Having options is always nice though. Kudos Nikon! Nikon D800/D7000 with Nikon DX 35mm f/1.8 lens. Exposure: f/4.0 2.0s ISO 1600. The Lost and Found Saloon is a neat little place on 36th ST, in the design district, a couple blocks west of the Target shopping center in downtown Miami. It has great food, friendly servers, and an interesting atmosphere. Its also open until 3am, which is perfect for me. Many times I'll be working late in Miami and I'll want some reasonably healthy food. My friend Olivia currently works there so if you see her, tell her I said hello. In case you're wondering... yes, I've been using my fisheye lens a lot lately. The thing is, I keep finding myself in situations where the fisheye is going to give me the best shot. This restaurant is small but the bar is fairly long and the entire wall behind it is interesting. 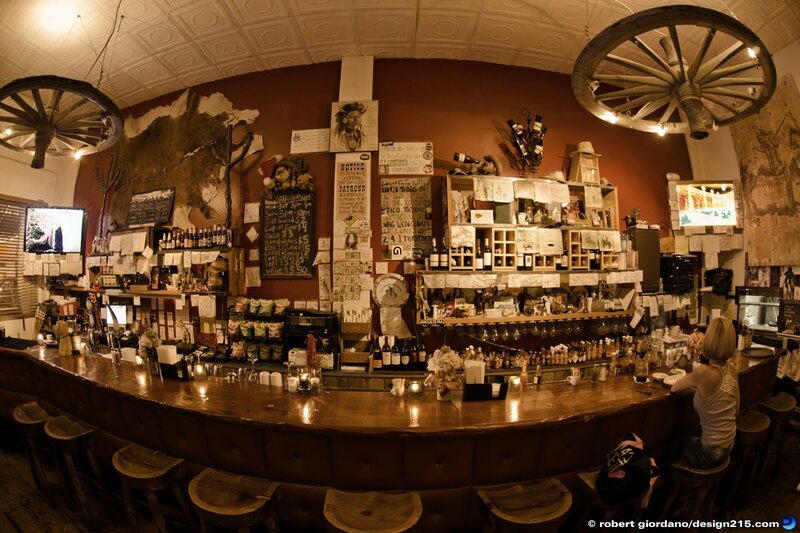 Even with my 12-24mm lens, I never would have fit the entire bar in a single shot. I used a shutter speed of 2 full seconds so my tripod came in handy. Nikon D7000 with Nikon 10.5mm f/2.8 fisheye lens. Exposure: f/4 2.0s ISO 200. Here's a little time lapse animation I made when I unpacked my brand new Nikon D800. I used a Nikon D7000 with a Nikkor 50mm f/2.0 lens. In hindsight, I should have used a little greater depth of field but whatever, I was in a hurry. People keep telling me, "Wow, that must have taken forever!" It actually didn't take that long. I started shooting around midnight and finished at 1:30am. I shot a total of 812 images. There was hardly any editing to do and I just added the music track. Simple. I have to say that I've seen way too many videos on YouTube where a person is unpacking their new camera and rambling on and on about it. I certainly was very excited when my D800 arrived but I wanted to do something a little more fun. I also didn't want to take forever making the video. I hope you enjoy it. The music is Fantasie Impromptu by Frédéric Chopin, one of my favorite piano pieces. Nikon D7000 with a Nikkor 50mm f/2.0 manual focus lens. Exposure: f/4.0 1/15 ISO 800. Tonight I went to Club Cinema in Pompano Beach, FL and filmed DJ Steve Aoki jumping from the second level balcony into an inflatable kiddie pool held up by the crowd!! This was the second time I've done video of Steve Aoki and he always puts on a good show. Last time, I didn't get any good footage of his balcony jump because I was behind the stage. This time I positioned myself on the opposite balcony so I could have a good view of the action. It still wasn't easy. The club was so packed that I sandwiched between people that were constantly jumping up and down and pushing against the railings. I have no idea how I managed to hold the camera as steady as I did. Nikon D7000 camera with Nikkor 18-105mm f/3.5-5.6G DX lens. ISO 1600. Zoom Digital Recorder. It was a long day and night. I photographed two back to back events, starting at 5:30pm Saturday, and ending at 5:00am Sunday morning. I shot enough pictures to fill two 16GB cards. I stopped to take this shot on my way home. I'm on A1A, about a half mile north of Sunrise Blvd. in Fort Lauderdale. Its 6:30am. Goodnight. Nikon D7000 with Nikkor 10.5mm f/2.8 fisheye lens. Exposure: f/4 1/125 ISO 200.